A study from the University of Helinski determined that humans and dogs share the same two genes that may be the cause of their enamel issues. Two genes, ENAM and ACP4, were previously linked in humans for their cause in enamel disorders were also found in multiple types of dogs. 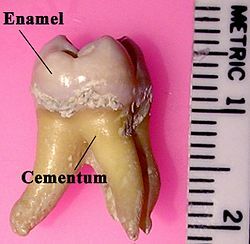 The disorder, Amelogenisis imperfect (AI), is what is known in humans to cause the hereditary disorders of the enamel. This disorder is linked with 10 genes including ACP4 and ENAM. The disorder can cause physical and dental harm to both dogs and humans. Mutations or defects in these two genes can cause developmental issues in the thickness of the enamel, quality or even absence of it entirely. The ENAM mutation controls the protein, Enamelin, which controls whether the teeth receive the correct amount of thickness of enamel. The ACP4 mutation is controlled by the phosphatase enzyme which we think controls cellular differentiation and mineralisation however this data is not fully clear yet. Dogs with the ACP4 mutation did show thin enamel and a slight mineralisation disorder. Due to dogs having the same primary and permanent types of teeth and similar numbers of teeth I think this is a very useful study to conduct. Previously, most of these cases remained undiagnosed but now we have a chance to learn more about the causes of these mutations and exactly what they control. This is both great for the human as well as there best friend, the dog for there overall health. I think this also a good study. Many dogs lose their teeth due to infections and other dental issues which can cause trouble eating and can potentially lead to worse conditions. This could help dogs live better lives.